The Rosemary beetle, Chrysolina americana (Linn., 1758) (Chrysomelidae), has long been abundant in southern Europe but has only fairly recently established itself in Britain. It was first found in Weybridge, Surrey but its distribution now extends across that county and it survives happily in central London. The process was summarised by A. N. Salisbury (Ent. mon. Mag. (2002), 138: 77-80) but since then it has spread into neighbouring counties. It may not be long before it follows the footsteps of the Lily beetle and it would be interesting and useful to track its invasion and colonisation. 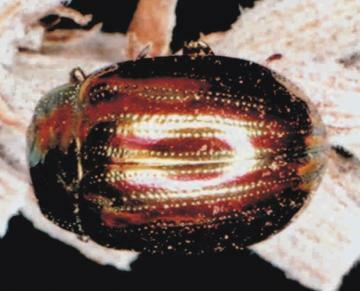 The beetle is quite large (about 7mms long) and distinctively patterned in shiny, metallic colours with double rows of strong pits. It feeds on rosemary, thyme and, especially, lavender; probably other labiates. 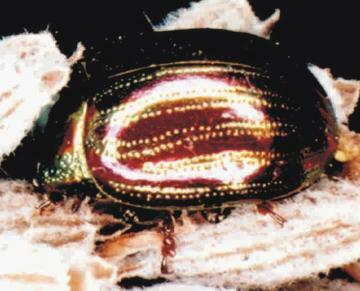 It would be a minor pest in gardens but might pose a threat to the Norfolk fields. We need the usual facts (where, when, how many) but as much other detail as possible: which plants, what habitat, activity etc.